Spaces From Yesterday is an exhibition series developed collaboratively between Amy M. Ho and incarcerated artists from San Quentin State Prison. For this ongoing project, Ho creates large-scale installations that draw on the multitude of stories that inmates tell about their lives before prison. The installations are all abstracted recreations of inmates’ memories of specific places, and are paired with inmate drawings of these places. Spaces From Yesterday: The Hallway is the second exhibition in Ho’s ongoing series, and was done in collaboration with Dennis Crookes. Ho and Crookes began planning this project at San Quentin and continued the project outside prison after Crookes was released. 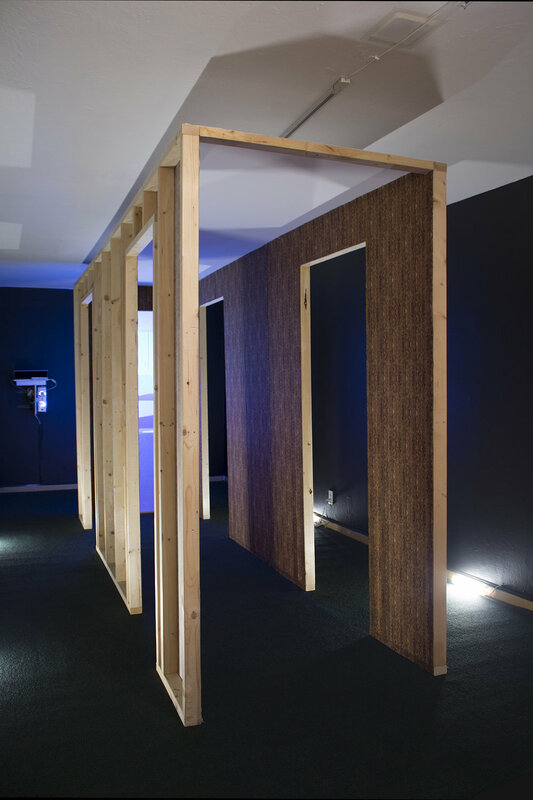 The installation is a recreation of the hallway from Crookes’ childhood home where he and his sister met to play chess after their mother was asleep. The hallway was illuminated by a lone night-light emanating from the bathroom at the end of the hall. The Hallway, and other installations in the Spaces From Yesterday series, serve as a platform for inmate artists to delve deep into their personal histories and share these experiences and stories with the public. In an environment where space is highly controlled, this project searches for the humanity and comfort that memories of past places can offer. Through the work, Ho hopes to help keep these inmates’ memories alive and to honor their experiences. Join us on December 10th for a conversation between Ho and Crookes. They will discuss working together on Spaces From Yesterday:The Hallway, the significance of memories in prison and the importance of art as a tool for self expression. Amy M. Ho builds video and spatial installations that bring attention to our existence as both physical and psychological beings. She received her undergraduate degree in Art Practice from UC Berkeley and her MFA from Mills College. Amy received a Zellerbach Family Foundation Community Arts Grant in 2016, a San Francisco Arts Commission Individual Artist Grant in 2013 and was included in Yerba Buena Center for the Arts' Bay Area Now 7 in 2014. She was a 2013 fellowship artist at the Kala Art Institute, an artist in residence at the Lucid Art Foundation in 2014, and an artist in residence at Project 387 in 2015. Amy is currently the studio director at Real Time and Space, an art instructor at San Quentin State Prison and a public education instructor at San Francisco Art Institute. She is represented by Chandra Cerrito Contemporary. Dennis Crookes is an artist that primarily works with acrylic and oil paint. Although originally a self-taught artist, he has taken classes under the direction of art teachers at San Quentin State Prison for four years. He has had his artwork displayed in over 20 galleries across California. Including Yerba Buena Center of the Arts’ Bay Area Now 2014, Tides Thoreau Center for Sustainability in 2015, the Santa Cruz Museum of Art and History in 2014, The Compound Gallery in 2014, Marin Museum of Contemporary Art in 2015, Alcatraz in 2013, and the San Francisco Library in 2013. In 2014, Dennis won an award for one of his linocuts, "Finding Out". He was a presenter at Open Engagement 2016 at the Oakland Museum of California. Dennis continues to paint and create. He resides in Los Angeles.